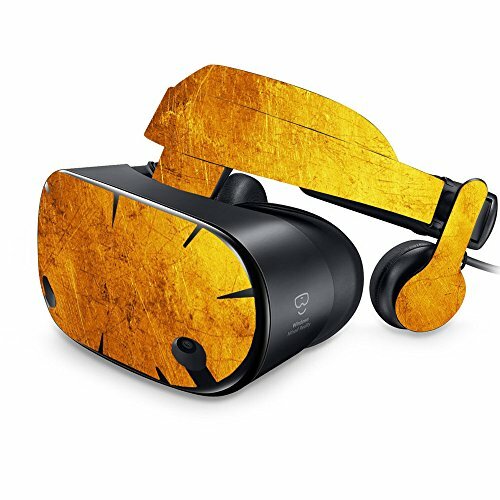 MightySkins Skin For Samsung Odyssey VR - Textured Gold | Protective, Durable, and Unique Vinyl Decal wrap cover | Easy To Apply, Remove, and Change Styles | Made in the USA by MightySkins at Kode Fu Guru. MPN: SAODY-Textured Gold. Hurry! Limited time offer. Offer valid only while supplies last. Do You Want Your Samsung Odyssey VR To Look Different Than The Rest? You're in the right place because we've got exactly what you're looking for! Do You Want Your Samsung Odyssey VR To Look Different Than The Rest? You're in the right place because we've got exactly what you're looking for! This Textured Gold skin is the perfect way to show off your gear! Or with hundreds of other MightySkins designs, you can be sure to find one that you'll love, and that will show off your unique style! Do You Want To Protect Your Samsung Odyssey VR ? With MightySkins your Odyssey VR is protected from scratches, dings, dust, fingertips, and the wear-and-tear of everyday use! Cover your Odyssey VR with a beautiful, stylish decal skin and keep it protected at the same time! Order With Confidence - Satisfaction Guaranteed! • Samsung Odyssey VR is not included. HUNDREDS OF CHOICES: Show off your own unique style with MightySkins for your Samsung Odyssey VR ! Don't like the Textured Gold skin? We have hundreds of designs to choose from, so your Odyssey VR will be as unique as you are! GOES ON AND COMES OFF EASY: Apply your MightySkins vinyl decal easily & with precision on your Odyssey VR thanks to a patented low grip air release adhesive that's built to last but removes easily and leaves no sticky residue when you're ready to switch to a different design! PROUDLY MADE IN THE USA: We Use Only 3M automotive-grade vinyl, the industry's most trusted brand,MightySkins are produced in our state-of-the-art facility in West Palm Beach, Florida. If you have any questions about this product by MightySkins, contact us by completing and submitting the form below. If you are looking for a specif part number, please include it with your message.